Utah Highway Patrol Trooper Aaron Beesley died from a fall during a search and rescue operation in Salt Lake County. Trooper Beesley, 34, was the tactical flight officer aboard a helicopter sent to rescue two teenagers stranded on the Mount Olympus trail. The 13-year veteran trooper elected to remain at the scene alone while the helicopter transported the hikers to safety. Upon returning, the pilot located Trooper Beesley’s body at the bottom of a 90-foot cliff. He had apparently fallen while attempting to retrieve some equipment. 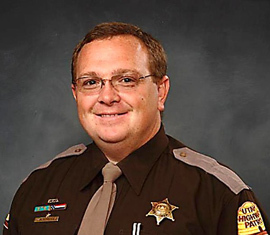 Trooper Beesley is survived by his wife and three sons. Wait for us up ahead. We’ll be along shortly. Never will i respect someone more than a person who has paid the ultimate price to try and make a positive impact on the world he leaves behind. Aaron, I did not know you personally but we are all family. You are forever in my thoughts and prayers. I knew Aaron for a few short months, Aaron had all kinds of faith in my abilities. Always made my fill good about myself..